InStyle’s Instagram of its May magazine cover featuring Amy Schumer. A South Shore bathing suit designer is in deep water after criticizing In Style magazine’s decision to put comedian Amy Schumer on its cover. 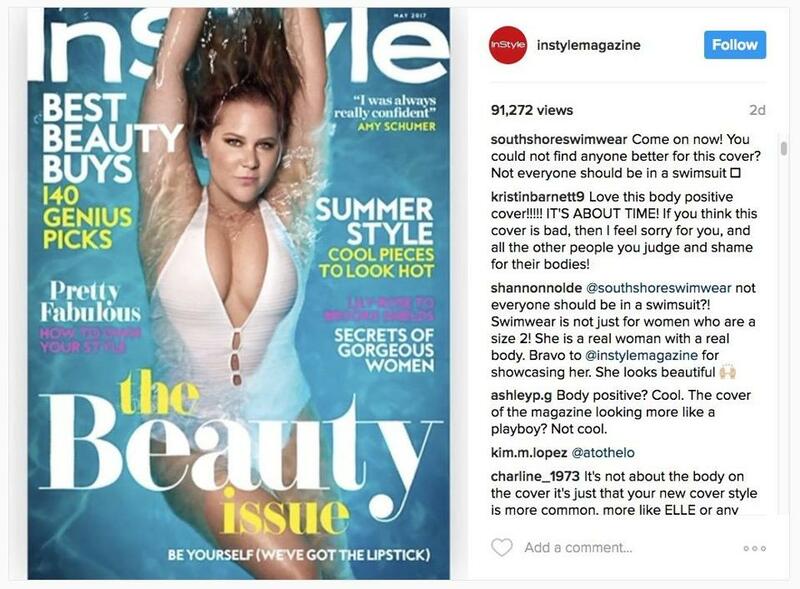 One of the first comments on the magazine’s Instagram post of its May beauty issue was written by Cohasset-based South Shore Swimwear. “Come on now! You could not find anyone better for this cover? Not everyone should be in a swimsuit,” it reads. As you might imagine, that sentiment is not shared by everyone and @SouthShoreSwimwear quickly found itself in the crosshairs, with many commenters accusing the designer of body shaming Schumer. She went on to say she’s receiving a lot of angry e-mails. Because of the backlash, South Shore Swimwear has minimized its social media presence, but that isn’t stopping women from tweeting about the company. @southshoreswimwear @SouthShoreSwim I won't be supporting your line! @amyschumer looks great! southshoreswimwear "A woman without curves is like pants without pockets. There's no place to put your hands." @amyschumer looks great!